Life can throw up some surprises. Last Saturday I commented on Facebook that I’d just read The Old Man and the Sea again. (I read it on my kindle.) It’s one of my favourite books by an author who I enjoy reading. Later that afternoon I went into Kadikoy, the big town down the road from me. I felt like a change of scene and a beer and something to eat out. Oh, and I needed a haircut. The man was very friendly and led me over to a bookcase of moth eaten paperbacks. I had a look anyway. I was there and I’ve learnt never to judge a bookcase full of second hand books by the first spine you see. I found two great books. One was a superb copy of The Old Man and the Sea. Really. Hardback, dust-jacket, fine condition, not price clipped, tight copy. Now, I’m a book collector. I collect first editions. And when I saw the unfaded spine of this book sticking out from the dross my heart missed a beat. Was it a first edition, first impression? No. It’s actually a much later edition. But I don’t care because it’s beautiful. And when I fan the pages under my nose I get a whiff of old musty paper. It’s a delight to hold and see and smell. I haven’t licked it yet, but I might. 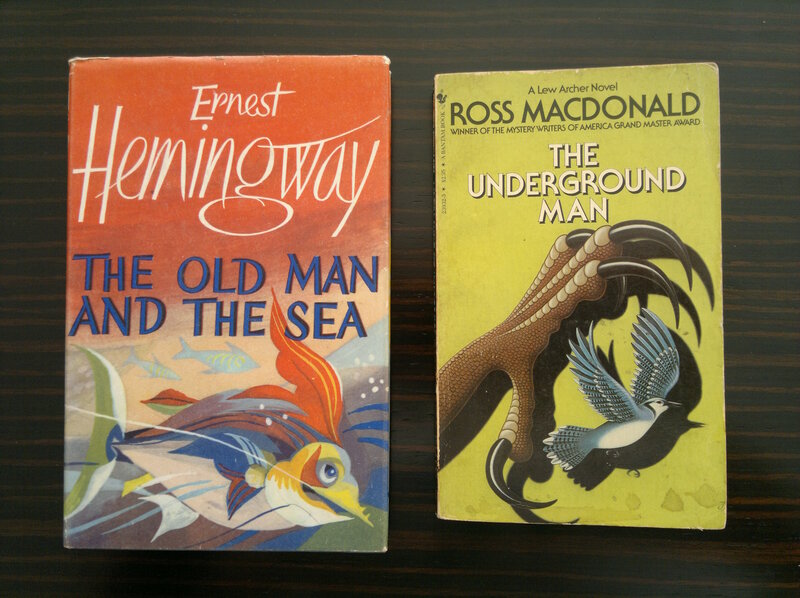 I also picked up a copy of a Ross MacDonald, Lew Archer book, The Underground Man, see photo. Not read any Ross MacDonald before but I’ve heard great things about him. And this was a fortuitous acquisition for another reason. I’m writing B&C#2. I wrote B&C#1 after a brief but intense fling with a Raymond Chandler book. Reading Chandler inspired me to have a go at first-person hard-boiled detective fiction. With Bad Sons I reckon I pulled off first-person soft-boiled detective fiction. No problem. It works for me. I’m going to read this Lew Acher and hope it will inspire me similarly with my prose for this second in the B&C series. Actually, I already started it. The flat was empty on Sunday afternoon. I got a cold beer and flopped on the sofa for an hour with it. You cannot beat a ‘real’ book for the multi-sensory pleasure that reading can be. Update: I finished it today. Brilliant. I have a new author to look out for. It might be remembered that Rope Enough had a very nice review from a ‘real’ author recently. (I linked to it here a couple of weeks ago.) The lady in question asked if I’d like to do an interview for her website and, of course, I was thrilled to accept. It went live today and here is the link. This entry was posted in Self-publishing and tagged Oliver Tidy, reading, real books by olivertidy. Bookmark the permalink. When Chandler left off Ross Macdonald began! In my humble opinion Macdonald outshines Chandler especially in the early Archer books. I am fairly sure that the Underground Man is one of those although it is years since I read it. They were all published in the 60s in England as paperbacks. Good luck with the next Booker and Cash………and please hurry up with it! It really was a great read. Wonderful economical prose, sharp dialogue and some terrific similes that I want to steal. I think I’m going to enjoy a lot more of his books. Two that I enjoyed (and just looked up). ‘We’re getting an ambulance for her.’ As I spoke, I could hear it coming in the distance, like the memory of a scream. Reading these greats really does get the juices flowing, if that doesn’t sound too ghastly to contemplate. Good to hear from you. You just can’t top a real book, so long as it’s also a good read, of course. As you see, I’m a collector. Not so much since I moved here and even less since I started properly writing. I think that book collecting was some kind of therapy for me being a frustrated writer, as in no opportunity to write. I must try a James Lee Burke. Would you recommend reading him in an order and if so which first? If not, which would you suggest? Enjoyed your post. You have been busy, but don’t forget us SPEA authors now you’re mixing with the ‘real’ McCoy. Newsletters seem to be ‘in vogue’ at the minute. I am conversing with another SPEA author on his newsletter. Newsletters seem so sophisticated to me, but it might be the way to go. By the way, I’ve got nothing to read at present: nothing is taking my fancy. So, how long are you going to keep a lady waiting. Thanks for your comment. I’ll try to remain true to my roots and not get carried away with the attention. haha. Newsletters, there’s an idea. Now I’m so totally famous maybe I should employ someone to write one for me. Acer #3 is still simmering, in a cooking and improving kind of way. I don’t think he’s going to be done before my annual holiday. And I don’t want to rush to get him out. You know how it is. Know what you mean about not rushing; leaving things simmering. My Third novel is still on the cooker. It’s finished, just keeping it warm until I feel it’s ready to serve-up. Should be in a couple of weeks. But, hey ho, I said that about six weeks ago. But as my mother always told me, something good always comes to those who wait.